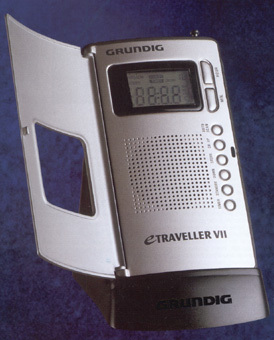 Surf the radio waves with the Grundig eTraveller VII. Both the perfect travel radio and everyday companion, this palm-sized radio is information headquarters. Measuring only 2.5 x 4.5 x 1 inches, its sleek, smooth design fits into your pocket, briefcase or purse and at only 5.3 ounces, it will never weigh you down. At home or traveling you can enjoy not only local AM and FM stations, but international shortwave broadcasts as well. With superior dual conversion superheterodyne circuitry, you will be able to hear stations from around the world. Shortwave coverage is 2-10.4 and 11-30 MHz. And you won't have to guess at the frequency. The informative liquid crystal display (LCD) shows you everything. Manual tuning is precise and fast or automatic scanning may be selected. Plus you can store up to 30 of your favorite stations in memories (10 AM, 10 FM, 10 SW) for instant recall. The included earphones provide full, rich stereo sound when listening to FM-stereo. The built-in Ferrite bar antenna provides good AM band reception from 530 to 1710 kHz (with 9 or 10 kHz steps). The built in 24 hour clock-timer will wake you to your favorite station, just like a full-sized clock radio. There is even a sleep timer function settable for 60, 50, 40, 30, 20 or 10 minutes. 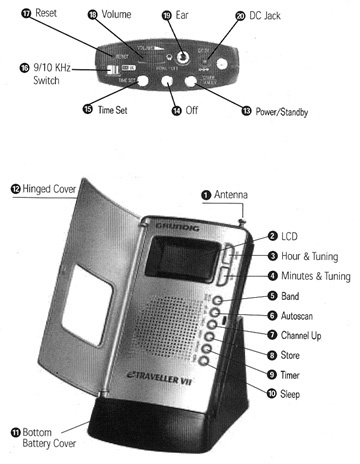 The top of the radio contains the 9-10 kHz AM band step switch, ear phone jack, 3 VDC input jack, reset, time set and power-standby buttons. 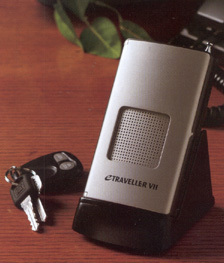 The eTraveller VII comes with: cradle type stand (as shown above), two AA cells, AC power supply (3 VDC 200 ma Center Neg), stereo ear plugs, carry pouch and Grundig Shortwave Listening Guide. Radio size: 2.7 x 4.5 x 1 inches 5.3 oz. (70x115x25mm 165 g).